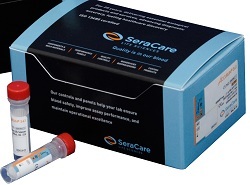 A NEW range of controls designed for the highly sensitive nucleic acid assays used in the detection of chlamydia and gonorrhea is now available from SeraCare. Accurun 341 controls are designed to monitor and validate the performance of molecular diagnostic tests for chlamydia trachomatis and neisseria gonorrhoeae (CT/NG). SeraCare says its Accurun controls are prepared with elementary bodies derived from cultured Chlamydia trachomatis and cultured colony-forming units of Neisseria gonorrhoeae – a whole organism design which simulates an actual patient sample. It says that these optimised controls challenge all test kit reagents, analysers, and test procedures, setting them apart from the competition. The Accurun 341 CT/NG controls are simply added to the test run, as if they were an unknown patient sample, with no need for reconstitution or dilution that could introduce contamination or variation. The controls are designed specifically for use on the four most popular platforms currently on the market. A significant advantage of this new control, says the company, is the use of instrument specific vials which allows the controls to be placed directly in the test platform. “This will significantly enhance chlamydia and gonorrhea testing overall,” said senior product manager for SeraCare Life Sciences, Michelle Stafford. “We believe that our impartially manufactured controls offer clinical diagnostic laboratories the means to ensure high quality”, she continued, adding that Accurun controls are themselves rigorously tested and manufactured in ISO 9001 and 13485 certified facilities.